How to download data from web using TR and TD tag names? Until recently, I was using the code below, which worked fine for a while. Now, all of a sudden it doesn't work. myURL = "http://finance.yahoo.com/quote/" & Symbol & "/financials?ltr=1"
Here's the error message. 'Access is denied.' I did some research on this, and I think it has to do with security, but I don't know what has changed recently, either on my machine or on the Yahoo site. Here is an image of my setup. Do Until sht.Cells(i, 1) = ""
myURL = "https://finance.yahoo.com/quote/" & Symbol & "/financials?ltr=1"
.SetRequestHeader "User-Agent", "Mozilla/5.0 (Windows; U; Windows NT 6.0; en-US; rv:1.9b5) Gecko/2008032620 Firefox/3.0b5"
Not the answer you're looking for? 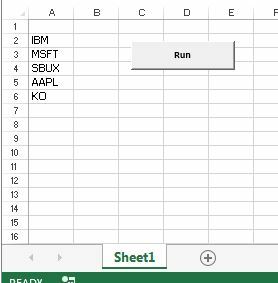 Browse other questions tagged vba excel-vba web-scraping excel or ask your own question. How to get tag value by tag name using web scraping in Excel sheet?